Home CDN , earn money , gift card , saving money , US , work-at-home , work-from-home , worldwide Get $5 When You Sign Up For Swagbucks in December! Get $5 When You Sign Up For Swagbucks in December! We've reached the Holiday season, and if you haven't begun already, now's the time to start shopping for the Holidays! Since this time of year in particular is a good one for having some extra money, Swagbucks is offering a $5 bonus to people who sign up through me this month! Swagbucks is a rewards site where you earn points (called SB) for all sorts of things you're probably already doing online, like shopping, discovering deals, taking surveys, watching videos, and more! Then you can turn your gift cards in to PayPal cash or gift cards to places like Amazon, Starbucks, and more! 2. Earn 300 SB total before 11/1. You'll get a $3 (300 SB) bonus for it! 3. 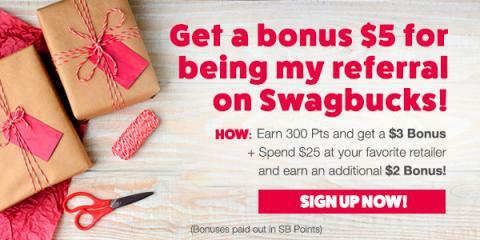 When you do your holiday shopping, spend at least $25 through Swagbucks Shop* and you'll get another $2 (200 SB) bonus on top of the cashback you'll get from shopping. That's it. It's super easy, and Swagbucks is for real. I use it myself, and I've earned 8,394 SBs in the past month! I am going to cash it in for Amazon gift cards and start my holiday shopping!